Goths In Hot Weather ©: Nobody puts Gothy in a corner! 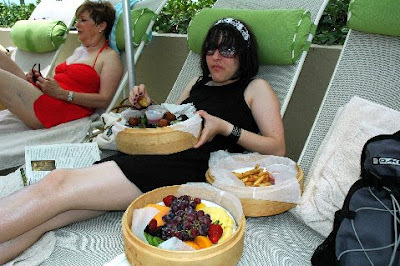 BobyGoth here is clearly not enjoying her time at the Country Club with her folks. What she doesn't know is that Undead Patrick Swayze is just waiting to whisk her off to a secret underground world of Industrialist Grinding and Gothabilly Bumping. Wait till she learns the secret of the 'Stuck in my coffin' move! OMG! Now I have cougar yellow fever! Did he just ruin thase $70 pleather boots in the saltwater? Gotta sacrifice for art, I guess. haha, YES! This was the first place I thought of when I found the video. Cheers! Yegads. Makes me remember just how awful it was to be young. So serious. So self-absorbed. So awful. Bless 'em. I love how they've all found their own slightly different set of moves that they each repeat OVER AND OVER AGAIN. Also, I'm confused... this looks like it was shot professionally? Who... would... do that? I was buying it until they started with the smiling! All those jokes about white people being incapable of dancing well were propagated by this subculture. Like, whoa. Don't be silly, the girl was simply caught mid-chew. I'll skip the video...I'm a goth and my dancing is the *best*, I promise you. COVENANT! Can't you read? Dead Can Dance are basically goth world music. That dancing is terrible. The guy looks like he's doing a goth Macarena the whole time. this has go to be Goth Angeles - no one's even watching (cept' the guy on the bicycle) as the Daystar wreaks havoc on their normal restraint. you just got goth served.. I got 58 seconds into this atrocity before the music just made me stop it altogether. Ouch. Did you guys all have the goth-impression game? We used to imitate one another's "key move" - that move you always end up doing the minute VNV Nation kicks on? Gawths always seem to repeat the same moves over and over... I know my particular arm-hip-stomp homebase and can tease every friend by imitating their own steps too. Angry german stomp, belly dance tribal hips, hippie tree goth with arms overhead, angry dead arm crossing vampire movement, almost raving with air glowsticks, pop and lock kick, the goth robot thriller... we all have one. Nothing in this is goth. It's nothing more than crappy dark techno. This is the garbage that has ruined the goth scene. My god, this is just awful. No wonder regular people think goths are idiots.